I finally have my computer back and now that we have started back into school, I can back to a bit more regular blogging about our lives. We went on a whirlwind road trip to see family this summer. We started at a family reunion for Rainman's side of the family. Three of his siblings were missing this year though. My kids were in heaven for numerous reasons......lots of cousins....and lots of babies! V-boy giving V-girl one is his "love" head butts. It is the most adorable thing in the world! Rainman, Mini J-girl, and A-girl. It warms my heart that my boys love babies just as much as my girls do! A-man with one of the happiest, easy-going babies ever....E-girl! Pool fun. Since we don't have a pool at our new house, they had a great time at the pool. There is A-girl in her fabulous homemade swimsuit. I cannot even tell you how many times L-girl and I fought over possession of the babies on this road trip! Seriously. Our cabin was near a town called French Lick, Indiana. D-man, V-girl and I went and walked aroundthe hotel and grounds. D-man is trying to get a selfie of himself with the fancy chandelier to send J-girl. From the reunion, we went and spent the day in Rainman's hometown so he could play a round of golf and attend their annual Pierogi Fest. I hung out at his brother's house snuggling with Mini J-girl and was a happy camper. Bonus: They brought me a plethora of Polish food to eat. Here is his cousin Paulie with the "Bushas"! We left his hometown and headed up to my brother's new place in Wisconsin. We even managed to get all the grandkids together in one place....that hasn't happened in awhile! I love their new place! Rolling hills, dirt roads, cows....and my family. I was in heaven. They have a river near their house, so the kids and a few grown ups went and played there, while the rest of us took the nearby Leinenkugel's beer tour! I don't even like beer...but I really liked the Summer Shanty and the Berry Shanty....which Rainman says doesn't prove a thing because they aren't "real" beers! This is my brother and his wife posing in front of their "Glamper". This is a random shot from somewhere they were visiting.....because I totally forgot to take a picture! I just wanted to show you were Rainman and I slept while we stayed there. It is the coolest thing ever. It really is the best way to camp. A real bed. Doors and windows to protect you from stray wildlife that may want to come and visit....but with screens and windows so you can see the stars and hear the nightsounds. I slept great!!!! It apparently even has a t.v. and DVD player if you want to watch movies! We had time to fix each others hair, tell an embarrassing dating story...or two....hurt Rainman's feelings (who was sitting in the next room with the guys) with above mentioned story....have a little more baby time...and then head over to Minnesota. In Minnesota we spent more time with my mom and sisters. D-man was in heaven with my mom's new to her lawn mower....we haven't had a riding mower at our house in years.....he was a very happy teenager! We concluded our whirlwind trip by spending a day or so visiting our friends that are, as my kids calls them, "almost cousins" in Iowa before our trip back to Georgia. And, I realized as I was putting together this post that I took exactly "0" pictures of our time with them. Zero! There really is nothing like family. I know some people don't really like their families, so seeing them, or not seeing them is no big deal. That is not how we feel. We love our families. Both sides. I love his side of the family, and get along great with them. He gets along with my side too, although I will admit there are times that he just sits back and shakes his head at us sometimes.....especially when I am with my sisters. I am sure it is just because we are just so darn adorable and clever that there are no words to describe it. Right? There is a comfort and safety when we are around them. They understand you....and your quirks. They will laugh until they cry with you.....I have discovered that this is a rare gift to have in your life. I felt like I breathed deeper the closer to Minnesota I got. I do love Georgia....now. But, it still really isn't.....home....yet. The 7 Minute Life is a calendar/organizing/planning solution....or, in their official terms....time management strategies to prioritize, organize & simplify your life. I got to try a 7 Minute Life Daily Planner for about a month.....because this was for me....an adult. The idea behind this planner is, basically, that time management is a process of planning - which means you take time to "think" about what you want to do....then you set goals.....the "what" comes before the "when".....as in, you aren't ready to actually put anything on your schedule yet. Now, you need to take the "what" and break it down into action steps....the micro-actions that you can actually accomplish. The point is to keep all of this is on a single piece of paper, so you can see yourself completing the goal.....and not lose track of the goal. How about the "7 Minute" part of it, you say? Well, that stems from a study that shows the average attention span of an adult....yes, an adult....is 7 minutes. I was discussing this concept with my friend Lydia and she was sort of horrified if that was the case. We were both left a little sad by the idea that we only have a 7 minute attention span. So, the idea is that you spend 7 minutes a day, planning or prioritizing how you will spend your time to accomplish your goals. One of the other interesting concepts of this Daily Planner is the 5 before 11 list. This means you choose 5 high value activities (that you allow in your life) for each day to accomplish by 11:00 a.m. This video is a mini-breakdown of the whole system and the mentality behind the system by the creator, herself, Allyson Lewis. It is well worth the time, and will leave you newly motivated to start your own 7 Minute Life. In case you need a little more assistance getting started, here are a series of little, short videos that will walk you through how to initially tackle The 7 Minute Life. Let me give you a few key points from the introduction section of the 7 Minute Life Daily Planner. Yes, there is about a 20 page introduction section to the Daily Planner. You can't just jump in and voila!.....you life is organized and productive. Nope. You have to do a bit of homework before you get started. The first thing Ms. Lewis recommends is slowing down. Yes. Slowing down. She wants you to slow down and think. Think about what is truly important in your life. The goal with making yourself slow down and truly think, is that it will help you re-connect with things in your life and rediscover your purpose. The goal is to cut through the noise of life and end the insanity by clearly identifying your purpose, values, goals, etc. Sounds pretty lofty, doesn't it. But, Ms. Lewis does a great job of explaining how you can get there in small, bite sized pieces. You still have to do the personal work yourself, but she gives you the carrot stick of the possibility of having a different life/day/hour/minute at the end of the work. You know, the old, Dr. Phil-ism....which, I think, Albert Einstein actually said first....."insanity is doing the same thing over and over and expecting a different result". So, yes, you will have to make changes...to get different results. The first step to your new life is prioritizing your top 10 values. Does this have anything to do with time management and planning? Well, actually, it does....or, more accurately, it should. You should be spending the majority of your time on things that matter to you....things that line up with your values. I had never thought of things in quite this way before, but the way it was explained, made a lot of sense to me. So, for instance, someone's daily planner whose personal values included values like "achievement", "excitement", and "power", shouldn't be the same as my daily planner, whose value words include "friendship", "joy", and "financial security". Once you have your values narrowed down, you jump into discovering your purpose. You know, what you do for others, or how your use your gifts and talents to change the world. Little things like that. There is a sentence prompt at the end of this section that really threw me. See what I mean? How do you even begin to answer that one. This Daily Planner takes a lot of thought and......homework. One of the best parts of this beginning homework section for me was the Your Highest and Best section where you are asked about what is the best use of your time right now, and to describe what you love the most, your strengths, your highest value activities, AND, how you want to be rewarded. In this day and age where we are asked to fit more and more into our days....whether it is work responsibilities, personal ones.....or church volunteer activities. You cannot do everything. You do have to say no to some things. Thinking of these things in the "highest and best way"....highest value....best use of your time....right now....is awesome. Taking on that project or saying yes to teaching that class at church, may NOT be the highest and best for you....and that is absolutely, positively, 100% okay. I had a light bulb moment when Allyson talked about the evils of "unfinished tasks" in your life. She quotes from a book by David Allen, where he calls unfinished tasks "open loops" in your brain. I knew exactly what they were talking about. These open loops just continually circle in the back of your mind....popping in to the front of your mind every now and again....making you think you need to get that done....now.....sometimes you smack it back into the recesses of your mind, but it will continue to fester and send out distress signals to your mind....making you miserable..... until you complete whatever that unfinished task is. I totally, totally, totally got that one. It is so true. 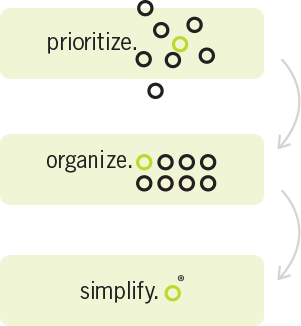 I am a list keeper by nature, so I do already keep a list of things that I have "To Do", because it helps empty my mind of some of those "open loops" I have going in my brain. But, I don't keep them in one place....so, I lose my lists....a lot....adding another "open loop" of having to find my latest list....or remembering what is on it! As much as I agreed with so much of what was said in the introduction of the Daily Planner and after watching Allyson explain things in the video, I was scared to start using it. I was scared to do the homework. I was even scared to actually write in the planner. I took me awhile to get through the homework. Longer than it should have. And, I will be honest, I didn't finished ALL of it (like setting 90 day goals), but, I did enough to learn quite a bit about myself.....and to get started using the Daily Planner. See? It has 5 before 11:00, Unfinished Tasks, What I Spent....and even the bottom section that shows how much water I drank, whether I slept enough, exercised, had reflection/devotion time, or even read. And ends with a simple, but profound question that sometimes depressed me when I had to say "no". The questions was: Did I do what I said I would do today? I did have to answer "No" quite a bit. But instead of letting myself sink into the depths of despair that I am a total loser that can't get anything done, I just gave myself permission to set smaller goals for myself. Okay, sometimes, I did let myself sink into the "total loser" category....but I didn't stay there long. There are sections that didn't necessarily apply to where I am in life right now. I do work from home, and I do want to grow my business...some... eventually.....but, I don't necessarily need to have contacts or connections or do networking....everyday. You know? Yes, I need to make dentist and doctor appointments and even an occasional contact with someone I am doing work for, but until I am at the point where I am going to expand my business, those sections didn't need to be quite so large....or even there. There is section on the next page that is for your actual appointments and voice mails. Right now, the appointments section was too small for me.....because we have a family calendar that we use for all 8 of us. But, I love the idea of "my" stuff being in one place...so I will be tweaking this. The voice mail piece I love, because usually, I am scrambling for a piece of paper and pencil wherever I happen to be when I listen to the message. Again, it keeps things simple.....all in one place....all in one book. The look of the Daily Planner is awesome. I love the green, however, now that I am in my mid-40's, my eyes don't work as well as they used to....so, in the places when the printing is in the lime green.....I had a hard time reading it and usually had to do the dance in front of my face where I moved in closer, tilted it so the light hit it better and figured out what it said. !!!! I like that you can start the Daily Planner whenever you want.....you aren't tied into a specific date, month, or year. You just write the date on top and start. Here is a way to close up some of those "open loops"! 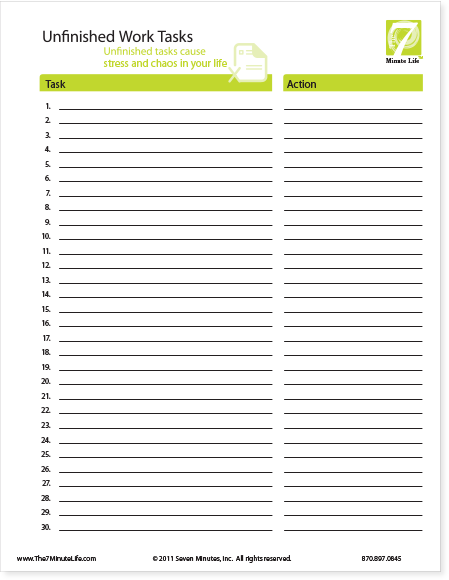 There is a lot of support behind The 7 Minute Daily Planner, like access to free time management strategy tools. 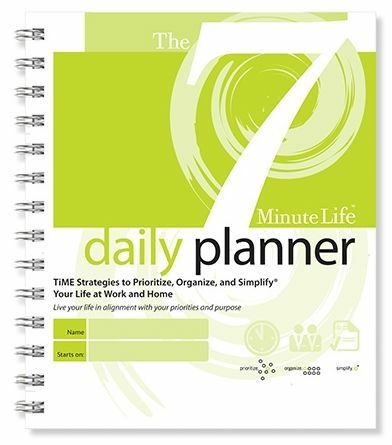 You can get your life under control, with less chaos, or even just do your own homework to find out your purpose in life, by getting your own 7 Minute Daily Planner for $24.95. 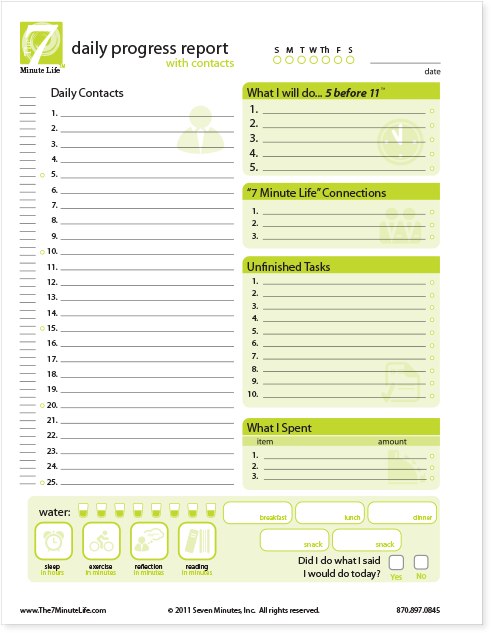 See what other TOS moms thought of the 7 Minute Daily Planner. I shared with you recently how much I love audio dramas. Well, we got the chance to review another great one when we received Under Drake's Flag from Heirloom Audio Productions. This is a very professional two CD set of Under Drake's Flag. The drama is based on G.A. Henty's book of the same name. It is designed for ages 6+....but, as usual, V-girl, who just turned 5 was listening in with us and enjoyed it too. I listened to this alongside A-man, S-girl, and V-girl. The back of the CD says that the CD has 2 hours of non-stop adventure. I agree. It was definitely action packed. We listened to this either while we ate lunch on school days or just after lunch when we would normally have read aloud time/quiet time together. Some days, the kids sat at the table and doodled while we listened. Other days we just all piled together on the couch and listened to the story. There are so many cliff hangers built in, that it was sometimes hard to know when to stop and restart on a new day. The story tells about Sir Francis Drake from the perspective of young Ned Hawkshaw, and Gerald (I call him Ned's trusty sidekick! ), who end up serving on Drake's ship. There is pretty much everything a youngster could want in a story....especially if that youngster is a boy. There are shark attacks, battles/fights, shipwrecks, damsels in distress, and, of course, the Spanish Inquisition. I will say that A-man enjoyed this a bit more than the girls....although I was surprised that they really paid attention to the story and watching their eyes get big when the story was unfolding was funny....and cute. D-man was home one day when we were listening and after complaining about how loud we had the volume turned up, asked what it was about. A-man told him and D-man said, "Oh, yeah, Drake and the Spanish Inquisition....we studied that last year." A-man stopped what he was doing and said, "Wait! This is a true story?" D-man then went into a mini-lecture of his own about how important Sir Francis Drake was in history.....American history. He said that thanks to Drake's genius military strategies, Spain lost a battle that they should have won. Had the Spanish won, they would likely have gone on to be the great European power instead of Britain and the new colony of America would not have been the same. America wouldn't be what or who we are now. It was an interesting conversation. Rainman even got in on the discussion of whether D-man was saying that it would have been a bad thing for America to be a Spanish colony rather than a British colony. The debate between the two of them trailed off into the kitchen, back to the living room and into the bedroom to put clean clothes away. The rest of us had stopped listening by then. Life in a homeschool house! Right? This is really and truly a high quality recording. The sound effects were so good, they were sometimes startling. The actors.....of which, there about 20.....were spectacular. Overall, it is just a quality drama. I love seeing the kids immersed in the story and sitting on the edge of their seats to see if the shark would attack or if the girl would be saved. Under Drake's Flag and the stories it tells of living in this time period, reminded me that we aren't necessarily raising our young men to be.....real men. If you know what I mean? I guess I am not really sure what I meant. Just that as I listened along with the kids, I realized how hard life was back then. That mother's had to be okay sending their young men.....boys, really....off to work out in the world. That those same boys ....like Ned and Gerald in Under Drake's Flag....had to have a strong work ethic, a lot of skills and be able to handle a lot of responsibility......and even deal with conflict without having a mom or dad to run and tattle to.....that boys in this day and age just don't have. It made me feel both blessed that I don't have to send them out into the world as a boy to serve on a ship out on the ocean.....and a little disappointed that my boys don't have some of those same skills that the boys in the story had. The characters in Under Drake's Flag faced some tough choices in life.....not the "tough" choices our kids make.....Who do I take to the dance? What do I wear? What am I going to do if I can't have my phone for half a day? These days, we prolong childhood with adolescence and don't expect much of them....or we explain their poor choices away by explaining that science has proven that their brains aren't fully developed until they are 25. That kind of logic didn't fly in Ned and Gerald's day. They were expected to be young men and perform their duties and make the right choices....whether their brains were fully developed or not. I know, I kind of went off on a tangent there didn't I? I really enjoyed Under Drake's Flag and so did, A-man. S-girl and V-girl liked it, but not as much as A-man and I.
I didn't use this every time we listened, but I usually looked through the questions and cherry picked a few that I thought they would be able to answer.....or that would start a discussion....or, picked a vocabulary word or two for us to learn. 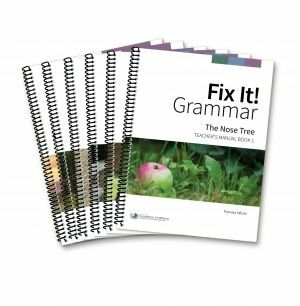 There is a much more detailed study guide available on-line which would enable you to really dig in as an in depth history study. There is even a mini-Bible study in the back of the book. The Bible Study II section on "True Manhood" just solidified the feelings that I was having about raising men It is a little fuzzy in my picture, but it talks about Ned's coming of age and particular ideas of what a "real" man is. Things like courage, self-sacrifice, mercy, wisdom, and faith in God. That is my kind of man....and hopefully, I am raising that type of man at my household. The total recording time was about 2 hours, but, he story moved really quickly. I will say it occasionally moved a little too quickly and we were left trying to figure out who was talking and who actually died....but we always figured it out, so it wasn't a big deal. 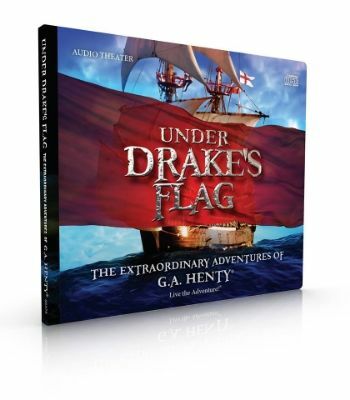 If you want to listen to a fun, well acted, exciting sounding historical story, you can get Under Drake's Flag two ways: An instant download for $20, or the two CD set that we got for $29,95. Go and see what other TOS Reviewers thought of Under Drake's Flag by Heirloom Audio Productions.